I don't get to spend as much time back home in Atlanta as I'd like to, so when I get to go back home I usually indulge in my tried and true favorite restaurants because I rarely get to go to them. However, because I always go back to the same places, I never really branch out to anything new because of the time constraints. Thankfully a couple weeks ago, I was able to spend some much needed extra time with my family in GA and suggested that instead of grabbing the same 'ol same 'ol, we try something totally new. I whipped out my iPhone and jumped on my favorite app, Urban Spoon, to check out what were some of the new up and coming spots to grab some good eats. 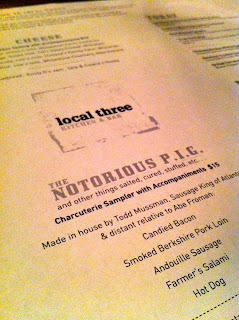 Local Three kept popping up as I scrolled through the pages and pages of restaurants in Atlanta's different burrows. I checked out the menu online and decided this would be the place. Local Three is situated inside of a well-to-do office building (actually where my dermatologist is located) and looks almost like a private club or speakeasy from the outside. You almost would never know it was there. Stepping inside is like stepping into a whole different world. The layout is simple and there is a massive bar, illuminated with shelves and shelves of the best liqueur they could offer. The decor is simple and very dark but the lighting is relatively bright and cheery. It has a very welcoming feel. There is no uniform for the staff, which also gives Local Three a very down homey, place-down-the-street, comfortable ambience. I would not suggest this place if you are on a tight diet, but Local Three does boast a very local and seasonal menu and their chef/owners especially promote their attention to quality and comfort, all a must in my book! Their menu items are all definitely inspired by the "southern comfort" that is naturally associate with Atlanta but they all pack exciting creative twists. Me and my parents decided we would take a "all or nothing" approach to this meal. We might as well dive in, instead of getting only a fragmented experience, governed by watching our weight. We decided to start with the duck fat fried hush puppies with a spicy aioli sauce that were nice and golden brown but fluffy in the center. We also tried the crispy brussels sprout leaves that were crunchy but still packed that wonderful cabbagey flavor that I so love. Just about anything fried in duck fat has to be amazing right? We then moved onto our entrees, which consisted of chicken pot pie, venison with peppered spaetzel and huckleberry sauce, and a deep marinated short rib with kimichi. After dinner we were totally stuffed to the rim. We had all so enjoyed each of our meals and each others, but when it came down to a vote, the simple chicken pot pie definitely triumphed over the other dishes. It was so light but packed full of succulent chicken and veggies that it just felt like home. Even though we knew we couldn't possibly fit in anything else into our tummies, we could not pass up the chance at one of their amazing sounding desserts. We chose the banana creme brulee topped with banana bread and served with a side of ice cream. What a delicious way to end a truly warming and comforting meal! 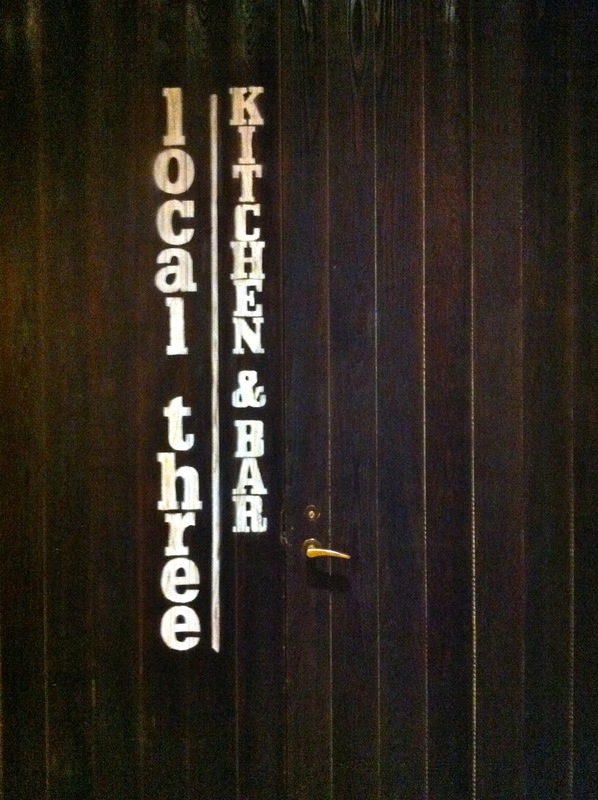 If you are ever in the Atlanta area, please check out Local Three Kitchen & Bar. They are located in the Buckhead area just off of 75N. Please also visit their website and learn more about their menu and creators! This place looks amazing!! Dan and I will definitely have to check it out on our next trip to the A. Have you got around to Farm Burger yet?? 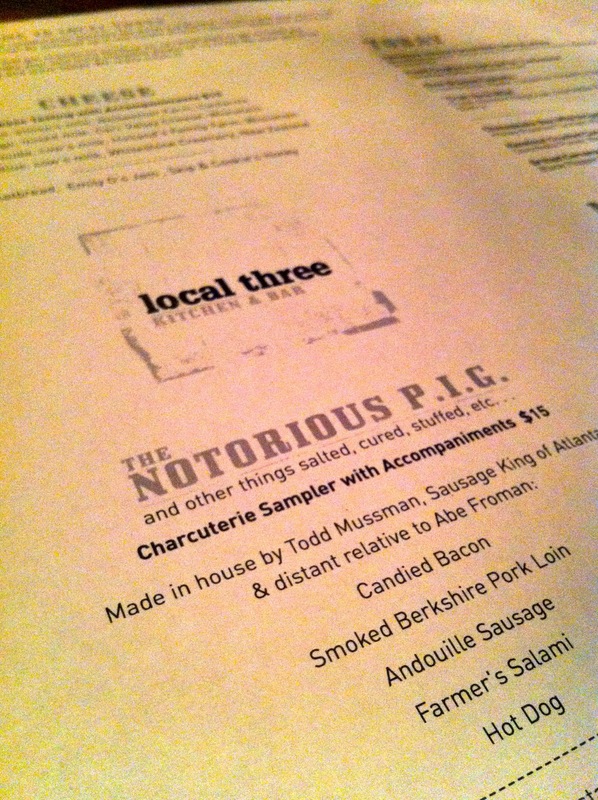 Completely local, organic, and DELICIOUS! It is incredible! You gotta try it the next time you're in the A-- and NO, I haven't been to Farm Burger yet, but I am planning to go in a few weeks around my birthday time! :D Can't Wait! I keep hearing amazing things about it!